In all the years of traditional shaving, some with the straight razor, I have spent a fortune searching for the ideal safety razor, one that I would really like and call a keeper. At last I think I have found it. Found them, I should say. It hasn't been easy. I don't know how many razors I have gone through before admitting more disappointment. Each razor had some shortcomings, some general and some specific: excessive blade feel, too aggressive, too mild, harsh shave, too heavy, too light, and some a downright bust. A variety of Gillettes, Tradere, Joris, Fatip, Muhle R41 (the meanest razor), ATT, iKon, BBS-1, Wolfman, Mongoose, The General, Sabre, and scores of others: I tried them all and then passed them along. In some instances, I feel I did not give the razor enough time. For instance, the Wolfman. Such a beautiful razor. Yet in the relatively short time that I had it, I was never satisfied with the shave, both the SB and OC versions. Perhaps in time I might have liked it and now I'll never know. On the other hand, BBS-1, another handsome razor made by Wolfman, was harsh from the first shave and it never settled down. And so on. Not until recently, when I discovered, in a relatively short time, RAW RS-10, Paradigm SE Ti and OneBlade Genesis, three razors that meet almost all of my requirements for a safety shaver. 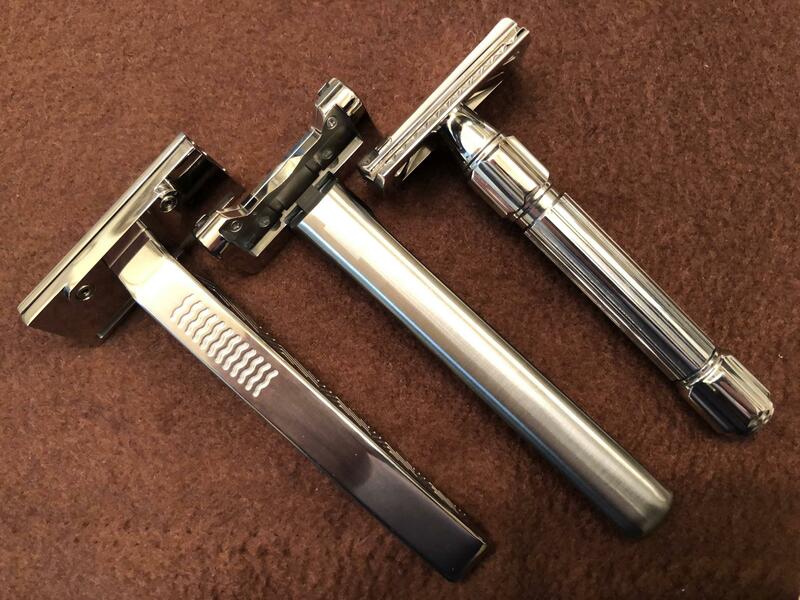 The three razors are completely different in characteristic, design and shave, two of them single edge and one double. I like each razor in its own way. Yet, if I were to rank them in preference, the lineup would be Paradigm SE, RAW RS-10 and OneBlade Genesis. The Paradigm and the RS-10 are keepers; I'm still not sure about the OneBlade — one day I like it and the next not as much. In the end, I might sell it . . . or not. Paradigm SE is close to perfect for me. I love the design; the weight is ideal for my arthritic hands; and the shave is the silkiest of any razor I have used through the years, straight or safety. The blade feel is minimal, and shave efficient and comfortable. I might add, remarkably efficient and comfortable. I could not have asked for a sweeter single edge safety razor. My blade of choice is Feather Professional — three shaves per blade, for me. RAW RS-10 is next in line for efficiency and comfort. The blade feel is minimal — sometimes I have to stop and check to see if I have a blade in the razor. Oh, that the shave head covers the blade tabs is a huge plus for me, as I really dislike exposed blade tabs. Fit and finish are superb, and there is some weight to the razor, but it is manageable. You can't beat a smooth and silky that the RS-10 offers — no DE razor comes anywhere near it in that respect, at least in my opinion. The Feather blade glows in the RS-10 — two shaves per blade for me. OneBlade Genesis takes some getting used to. Actually, I find the learning curve a wee bit too long for my taste. Here is another razor with impeccable fit and finish. I like the razor's design. The pivoting shave head is quite efficient going north and south around the jaw line. On the other hand, I have yet to master the razor around the upper lip and chin. Predictably, the OneBlade is easy to use regardless of the learning curve for maximum efficiency. Some complain about the razor's proprietary Feather blades, but I don't mind it. One shave per blade does it for me. I have had regrets purchasing some razor — many regrets, I should say — but I have no regrets buying these three. They are pricey, yes, but to me worth it, since they give me much enjoyment. Perhaps my OneBlade, too, will become a keeper. You never know about the fickle world of traditional shaving.